On today's blog post, we've teamed up with Johnny Vasquez and Lacie Lynnae from Yarn Nation to present our best tips for taking care of the handmade sweater you’ve spent the time and energy to create. You’ll want to take care of it so that it will last a long time and stay in good condition; today we’ll be looking at how to care for some of the most common knitting fibres: wool, cashmere and alpaca. Some wools and animal fibers can be machine washed, but to play it safe we usually recommend hand washing. To wash by hand, place the garment in a sink or bowl full of lukewarm water with 1 tsp of Eucalan no-rinse wool wash per gallon of water. Let your garment soak in the water for about 15 minutes. Gently swish the garment around but be careful to not agitate the water too much. Drain the water from the sink or bowl and press any excess water out of the sweater. Do not wring the water out as this can cause stretching and felting. DO NOT USE A DRYER! We're sure you already knew that, but sometimes things get thrown into the dryer as a matter of habit and you end up with a tiny shrunken sweater. Never put wool in a dryer. Seriously, don’t do it. 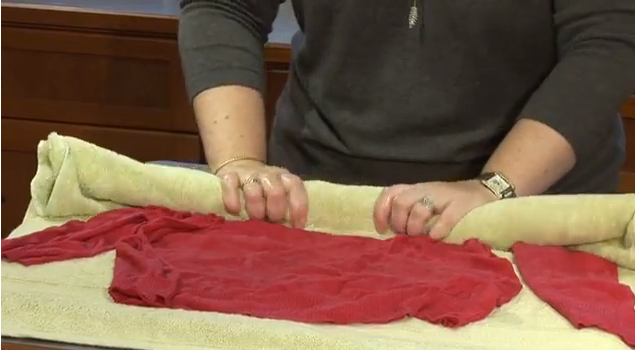 After washing, squeeze the water out of your garment roll it in a clean, dry towel to remove excess moisture. When you’re picking up the wet garment be sure to support it from below. If you lift if from the top the weight of the water in the sweater can cause it to stretch. Lay the item on a dry towel and shape the garment back into its original shape. Allow your sweater to dry completely, away from direct sunlight or heat. Sometimes even the nicest wools and cashmere may pill where there is friction on the garment (like the underarms or shoulders). Pills are the little balls of fiber that start to gather on your sweater, and can make the garment look shabby if not removed. These annoying little balls of fiber can be quickly taken care of with a small hand held electric de-fuzzer, a sweater stone, or if you’re feeling super patient, by picking them off. This keeps your sweater looking fresh and new. Garments have a tendency to pick up pet hair, people hair, and fluff. It is particularly obvious if your sweater is a dark color. Keep your clothes neat and tidy by using Eucalan’s lint remover sheets to remove those unwanted particles. Keeping a few in your purse or car (once you’ve gotten out of the reach of your fluffy feline) might be a good plan to keep your sweater looking sharp. When you are finished wearing your sweater for the season, it is important to put it away clean and in a sealed container if possible. Pests like moths are attracted to body smells and will quickly eat a hole in your treasured garment if it is not cleaned before storing it away. Also, body oils, perfumes and deodorants can discolour fabric over time. Make sure to wash your garment before storing it! 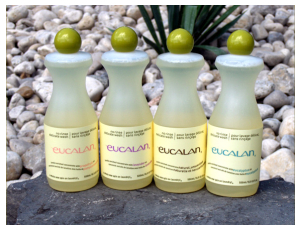 It woulld be a good idea to wash the garment using Eucalan's Eucalyptus or Lavender scents to deter the pests. Allow to dry completely then wrap your sweater in several sheets of tissue paper and store in a sealed container. For extra protection you can purchase sachets of lavender or cedar disks to put in the container with your garment. One great benefit of going this route is that everything will smell fantastic when you open the box to use your sweaters again. If you have concerns that moths may be in your knits, place the article in a plastic bag and put in your freezer for 2 days to kill moths and larvae. If you’d like to learn about how to choose a great yarn and everything else that goes into preparing to knit a sweater, download the free Sweater Planning Guide from Yarn Nation. In this guide you'll learn about choosing a suitable yarn, how much yarn to buy and how to plan a sweater that you’ll love! This guest post is a part of the 30 Day Sweater Challenge promo tour. This coming October, 5,000 knitters around the world will be knitting a sweater they’ll love in 30 days. To sign up just visit 30daysweater.com/eucalan and download your free Sweater Planning Guide. It will help you get started on the right foot! See you in October! Different fabrics have different textures and consistencies thus they are maintained in a different way. It is always better to know stuff on how to take good care of them to prevent damage and unnecessary expenses.